The Butler Aviator swimming team won its 15th straight Greater Western Ohio Conference North division title last weekend at Trotwood-Madison High School. TROTWOOD — This past weekend the Aviators competed at Trotwood High School for the GWOC North title. The Butler boys were very successful, winning their 15th straight title. The girls came up just short of Tipp City, taking second place. All three girls A relays were very successful.The 200 freestyle A relay of Evelyn Towe, Rachel Shively, Brooklyn Baker, and Sydney Aller took second place with a time of 1:51.65. The 200 medley relay of Erin Dean, Sydney Aller, Katie Bonifas and Abbey Burton took third place with a time of 2:03.31. Finally, the very impressive 400 freestyle relay took the win for the Butler girls. The A relay of Gwynne Rohde, Erin Dean, Katie Bonifas, and Abbey Burton finished with a 3:59.01, out-touching the Red Devils but just over a second. All three relays will compete in GWOC finals this Thursday. Making podium individually were the following swimmers: Sydney Aller second place in the 200 freestyle (2:07.48), Gwynne Rohde second place in the 500 freestyle (5:45.58) and, Abbey Burton second in the 100 butterfly (1:06.35). These girls automatically qualified for GWOC finals this Thursday. All three boys relays were also very successful. The A medley relay of Khalil Ruiz, Sam Martin, Adam Gunckel, and Matt Brunsky took first place with a time of 1:43.40 and the B relay of Riley Brady, Evan Lozan, Eli Neal and Jackson Baker took second place with a time of 1:48.50. The 200 freestyle relay of Jackson Baker, Sam Martin, Eli Neal, and Cameron Tuttle took third place with a time of 1:38.24 finishing just behind Tipp City. Finally, the 400 freestyle relay of Matt Brunsky, Khalil Ruiz, Riley Brady, and Adam Gunckel took first in a very close race with Troy. Making podium individually for the boys were the following swimmers: Matt Brunsky first place in the 50 freestyle (22.05), Matt Brunsky first place in the 100 freestyle (49.45), Riley Brady second in the 200 freestyle (1:56.32), Riley Brady second in the 500 freestyle (5:14.73), Adam Gunckel second in 100 butterfly (56.89), and Adam Gunckel first in the 200 IM (2:05.33). Thursday January 31 the girls and boys will swim in GWOC finals at Trotwood High School. The meet will begin at 6:00pm. 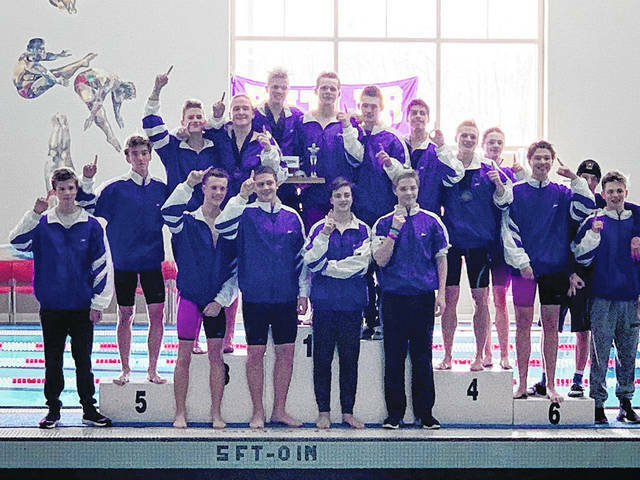 https://www.vandaliadrummernews.com/wp-content/uploads/sites/19/2019/01/web1_Swimming.jpgThe Butler Aviator swimming team won its 15th straight Greater Western Ohio Conference North division title last weekend at Trotwood-Madison High School.